ST-KFIM is applicable for a wide range of fabrics, from tension-sensitive lycra fabrics to stable woven, technical and upholstery materials. This Fabric Inspection and Rolling Machine can be supplied to operate from plait/loose fabrics to roll, or with various other fabric inlet or outlet options. 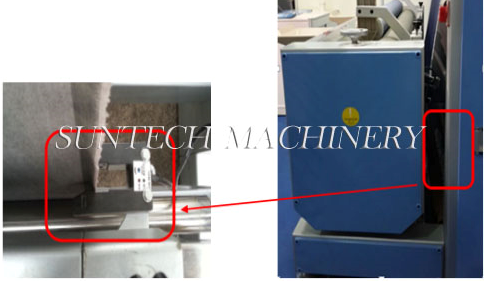 Active unwinding by motor driven twin roller. 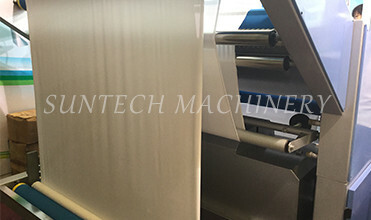 It will allow for continuous fabric inspection, from one piece of roll to next, no need to feed fabric again. The dancing roller is specially designed for tension control. It will move up and down to control the fabric tension. 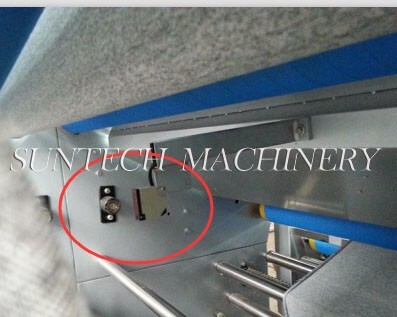 Suppose the speed of feeding and re-winding are not synchronous, the potentiometer installed on one side of dancing roller will send signal to the inverters on the feeding position and rewinding position and inverters will adjust the speed to the same. 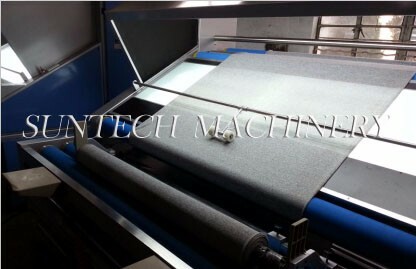 60 degree fixed angle inspection screen which has been erified thousand times to prove to be the most suitable angle for knitted fabric.It has the least influence for fabric tension. Three sets of Scroll Roller and One set of Air-blowing device to control fabric curled edges. 1. 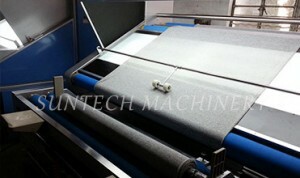 Before inspection table, the scroll roller will make fabric open totally when inspection. 2. After inspection, the scroll roller will open fabric curled edges again to make sure a accurate edge-align. 3. 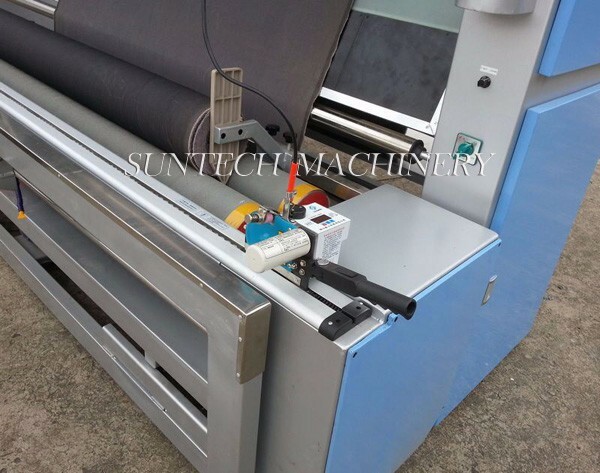 Before rewinding, the scroll roller & Air-blowing device will once more open fabric and eliminate crease for perfect roll generation. Also the Digital Counter Meter also have the pre-set function. Means if you need 100 m, you pre-set the length on the counter meter. When arrives 100m, the machine will stop automatically. Edge Alignment Photo Sensor will align the fabric edges accurately. When fabric declines, the rewinding station will move left or right for aligning. 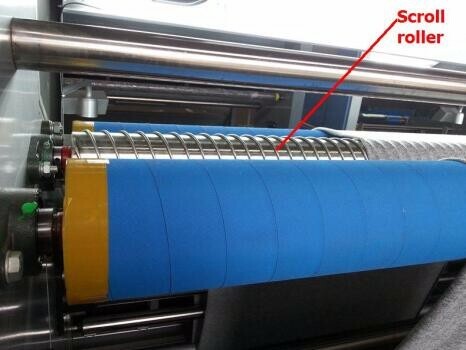 Consistent roll output by actively surface rewinding with twin rubber-covered roller. The roll compact could be adjust due to different ratio of the rollers. You could adjust the roll hardness (Loose or Tight) through the hand-wheel. Appearance: In the wool of knitted fabrics, the horizontally continuous loops are woven from thicker or finer yarns. Usually more than a single root, but even there are parallel or multiple roots. It is different from the normal one. Cause: When knitting fabrics are weaved, the operator misuses yarns of non-designated counts or Danny specifications. Misuse of finer yarns makes the fabric appear thin. When the coarser yarn is misused, the fabric appears dense. 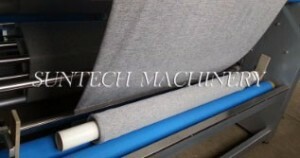 Appearance: The warp of the woven fabric has a single one or a number of non-specified specifications. If it is a finer yarn, it is called FineEnd. If it is a thicker yarn, it is called Coarse End. Cause: In the warping period, the number of yarns received by the thread is wrong, and warp yarns of non-specified specifications are used. Such cockroaches are often full-bodied. Appearance: The weft of the woven fabric, there is one or a continuous number of non-specified specifications. If it is a fine yarn, it is called FinePick. If it is a thicker yarn, it is called Coarse Pick. Cause: During weaving, the weft yarn of the weft yarn, or the yarn count of the shuttleless weaving machine is incorrect, and the weft yarn of non-specified specification is used. After the operator discovers it, he will stop it and remove it. However, the automatic change of the looms is often difficult to find. Appearance: The weaving method is wrong, and the texture of the cloth is different from the original designer. For example, the left twill is woven into a right twill or the like. Causes: Generally caused by wearing errors. 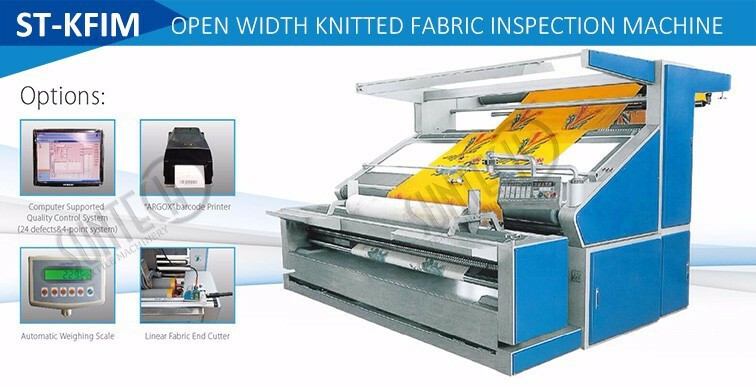 Others such as jacquard fabrics have wrong patterns, and warp yarns of multi-standard warp fabrics are arranged incorrectly.